Change in the staffing pattern of different categories in Traffic and Commercial Departments viz., ASMs, SM, Guards, TCs etc. 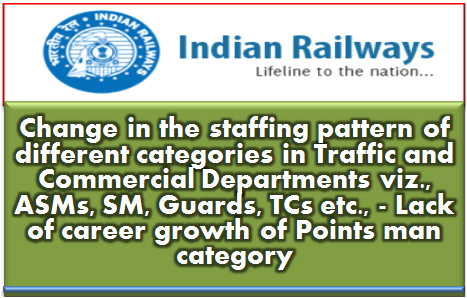 Sub: Change in the staffing pattern of different categories in Traffic and Commercial Departments viz., ASMs, SM, Guards, TCs etc., - Lack of career growth of Points man category-reg. Ref: (I)NFIR's PNM Item No.32/2012. (II)Railway Board's letter No. E(NG)1/2012/PM/I/22 dated 15/07/2015 addressed to the federations. (iii) NFIR's letter No. WllPart XI dated 06/08/2015,02/02/2016 and 18/04/2016. (iv) Special meeting held on left January 2017 on left over PNM Items relating to E(NG) Directorate - Railway Board's letter No. 2016/E(LR)/MM-16 dated 14th February 2017. Kind attention is invited to NFIR's PNM Agenda Item 32/2012 and the Railway Board's final proposal sent to the Federations vide letter dated 15/07/2015. Though the Federation had conveyed its consent with minor modifications for issuing formal instructions to GMs, over more than two years back, unfortunately no orders have been issued by the Railway Board, consequently staff are put to disadvantage. "16 2/30% by promotion entirely on merit of regular employees with 10+2 qualification of all Departments in GP 1800 and GP 1900/- with a minimum of 3 years aggregate regular service on the basis of a competitive examination consisting of Written Test and Record of Service of 85 and 15 marks respectively. Those with matriculate qualification on the date of the issue of these order will also be eligible." The issue has also been discussed more than once with the Railway Board and Federation stated both commercial categories i.e. Commercial Clerks and Ticket Examiners (GP 2000/Pay Level 3) be thrown open filling 16 2/3 vacancies by the employees of all departments through competitive examination. NFIR, therefore, once again urges upon the Railway Board to kindly see that revised orders are issued soon. Param News: Central Government Employee News|Latest DOPT OM: Change in the staffing pattern of different categories in Traffic and Commercial Departments viz., ASMs, SM, Guards, TCs etc. 16 2/30% by promotion entirely on merit of regular employees with 10+2 qualification of all Departments in GP 1800 and GP 1900/- with a minimum of 3 years aggregate regular service on the basis of a competitive examination consisting of Written Test and Record of Service of 85 and 15 marks respectively.